Two Major Deportations - Judah had been warned of the calamity of an exile. Then it happened! Jehoiakim's uprising signaled the beginning of the deluge though he met an untimely death before Babylon could avenge him personally. His successor, Jehoiachin, lived to face the vanquishers and was carried away into exile in 597 B.C. along with the nobility of the land, palace officials, and might men of valor and all the craftsmen and smiths. The second deportation came in 586 B.C. as a consequence of the revolt led by Zedekiah. Some citizens were left behind and took refuge in Ammon, Moab, and Edom. A sizeable contigent fled to Egypt taking the prophet Jeremiah with them as a prisoner. We cannot be certain about the total number taken into captivity but it must have numbered many thousands. Has God Abandoned Us? - With the institutional supports for their religious faith swept away, the Holy Land devastated, the temple in ruins, and Jerusalem but a smoldering heap of ashes, the deposed citizens of Judah found themselves in the clutches of despair. The deep note of dejection and pathos, felt by the exiles, is evidenced in the Lamentations of Jeremiah and denoted by the psalmist. Grief of unprecedented proportions weighed heavily upon the hearts of the captives. Judah, like a lost child in the dark of night, cried out for some assurance that the Father was near. The captives grappled with the horrible thought that God had rejected them. Are Babylon's gods More Powerful than our God? - Perhaps the Lord's power had been overrated and now at long last he had met his match. The exiles had been toying with the idea that they might have been following the wrong God. Should they put their trust in other gods then? Change their allegiences? No! Declared the prophet. Let Judah be spared the folly of following mere idols who are unable to do anything. Punishment for the Sins of our Ancesters perhaps? - Some exiles had a simple explanation for their crisis. It was God's fault! God was venting his wrath on the children for the sins of the fathers. Ezekiel attacked this kind of thinking with a fury. The prophet vindicates God's justice by proclaiming that individuals are responsible for their own inflictions. The bear not the weight of other's sins but the weight of their own. The Exile Interpreted - Judah's tears were dried by the prophets by bringing good news which was relevant to Judah's needs. God has not abandoned his people - Was there a shred of evidence in the whole past history of Israel that God had ever walked out on his children? NO! God's own had abandoned him, but the waiting arms of a loving, merciful God were always open, ready to recieve the rebels back. And when they turned and sought God, they found him and God would take Judah back into his arms. God has judged because he loves - In the days of King Hezekiah, the prophet declared that God would wash away the filth of Zion and the bloodstains of Jerusalem by a spirit of judgment and of burning. A God who loved couldn't permit his people to destroy themselves, and so he had judged. Painful? Yes! But out of this pain would rise a purified people ready to march again on the road to triumph. A remnant shall return - Judah's days in Babylon were numbered. Purified and purged, the exiles would leave this strange land behind them and take up the work of building a kingdom again. Judah was the remnant destined to inherit the promises of the new era. Be a blessing where you are - When opportunities for witness present themselves, they must be grasped. Judah's destiny, "to be a blessing", would not wait for some more opportune moment in the future to be fulfilled. The prophet called for the exiles to work NOW in Babylon. The End of Captivity in Babylon - Restoration was promised and it would come. Hence, a captive people began to look for signs and saw them. In 562 B.C. Nebuchadnezzar died. One year later, Jehoiachin, the deposed Judean monarch was released from prison and sat daily at the new king's table. The kind of tolerance in the palace would certainly lead to an early release. However, Babylon's tolerance did not bring freedom. Persia crushed Babylon in 539 B.C. and Cyrus, ruler of the world, issued an edict of restoration and Judah was free. The long exile was over. 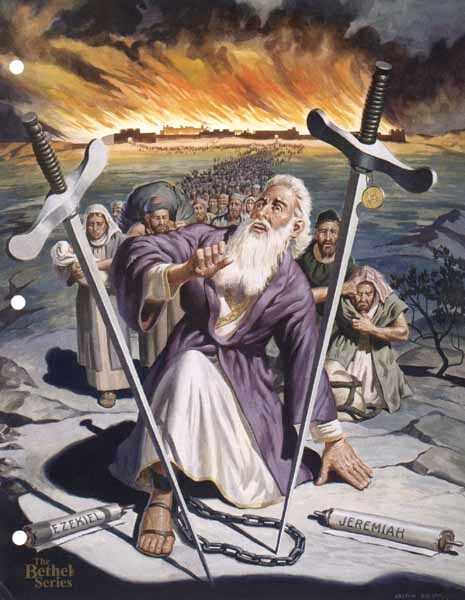 Two great swords in foreground - Powerful military forces from Babylon throttle the revolt led by Zedekiah, last king of Judah. Burning city in background - Jerusalem is pillaged and destroyed. Masses move out and away from burning city - Judah's citizens are carried off into exile by the Babylonian hordes. Pathos on central figure's face - Destruction of Jerusalem and implications of exile bring great despair to Judah. Ezekiel and Jeremiah scrolls - The prophets are especially identified with events prior to and during exile. Woman carries infant in arms - Prophets renew hope in this time of crisis by proclaiming that "a remnant shall return."